Compensation applied for gross errors in dates vs. sols. From Ls 158.8 to Ls 218.6, between August 22, 2012 and December 4, 2012 there were five days reported by the REMS Team in which pressures were Earth like. These dates were from September 1 to September 5. The primary graph below assumes that the REMS Team was careless and meant to publish the units as Pa rather than hPa. This assumption was also made by Ashima research which applied it to its publically available MSL weather reports at http://marsweather.com/data. 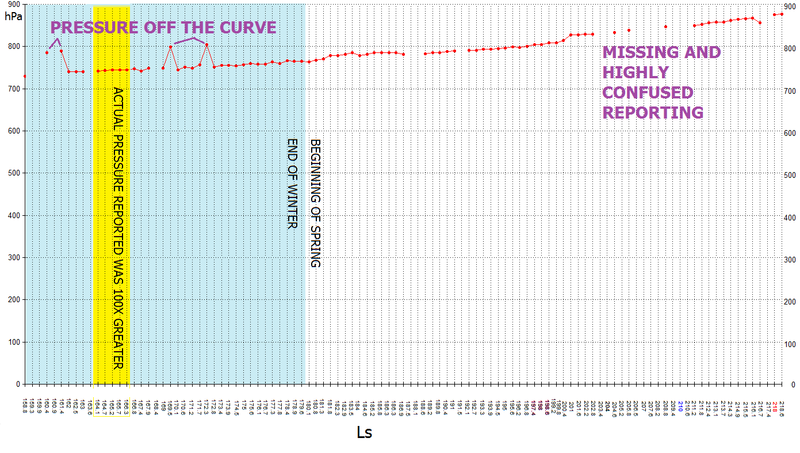 The insert on the bottom table shows what the graph would look like if the 5 days at the high pressures were correct. For more detailed reporting and futher up to date data see my MSL Weather Record page. Table 1 - Data up until Ls 218.6 on December 4, 2012. Table 2 - Data up until Ls 199.8.